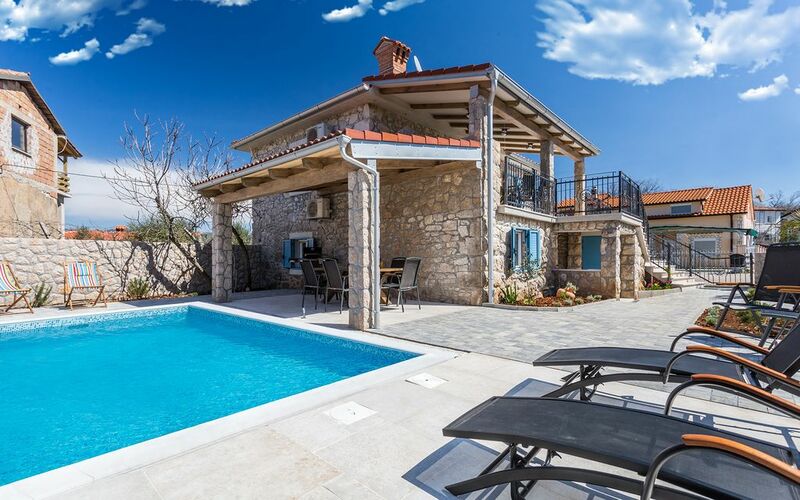 Old stone house apartment with a private swimming pool is located on ground floor in a traditional mediterranean stone house. House has a special charm as it was built in 1890 and it was completely renovated in 2018. The interior of apartment is furnished in the spirit of the local mediterranean tradition and adapted to the needs and requirements of modern lifestyle. The sea is just 2500 meters away, close enough to easily reached it, but still far enough to avoid all the hustle. By the stone house is a surrounding of 400m2 with three shaded parking spaces, beautiful garden with more than hundred years old olive three and spacious and conveniently placed private terrace with outdoor dinning table for 6 guests. You can savor in the private swimming pool, have a drink in the shade or even make your own dinner at the grill. The swimming pool is the size of 18m2. You can relax by the pool on deck chairs or refresh under an outdoor shower. Parking spots are shared with owners, that use first floor apartment only on weekends. Before you enter the 65m2 apartment, you will step under the arched stone entrance. There you can sip your coffee on the coffee table, read a book or play darts. There you will find an entrance to first bedroom, which has double bed, flat TV and a fan. Next door leaves you to entrance of the rest of apartment. You will enter to open space with fully equiped kitchen with hidden washing machine, a dinning area for 6 guests and a living room with sofa and flat SAT TV. You can easily pull open the hidden extra mattress on the sofabed in the living room if you wish to accommodate two more guests. Another lovely double bed bedroom with a SAT TV is in the next room. Apartment offers bathroom with a shower, toilet, a bidet, a fan and towels. The apartment is air-conditioned and provides free WiFi connection. Fine linens and accoutrements offer peaceful nights sleep. Traditionally mediterranean designed apartment offers comfortable and modern interior. Outside, in the yard, there is a private swimming pool, equipped with RGB lighting for night swimming, sun deck chairs and a garden furnishing for six people. It is surrounded by a beautifully decorated mediterranean garden with a 200 year old olive three. Tolles Apartement in einem sehr schönen Haus! Mediterraner Style,1B Lage,sehr nette Vermieter. Mit Pool,Grill und einer detailverliebt eingerichteten Wohnung.